WASHINGTON — The White House is preparing to replace H.R. McMaster as national security adviser as early as next month in a move orchestrated by chief of staff John Kelly and Defense Secretary James Mattis, according to five people familiar with the discussions. In an interview on MSNBC Thursday, Rice called McMaster "one of the best generals of his generation." "He’s doing a really fine job as national security adviser," she said. "I have no idea about his future in that job. I hope he stays, he’s really good." Rice called Biegun "an outstanding person." "He’s an expert in foreign policy and of course has spent time in the private sector and obviously he would be very, very good," she said. "But let's wait and see because H.R. 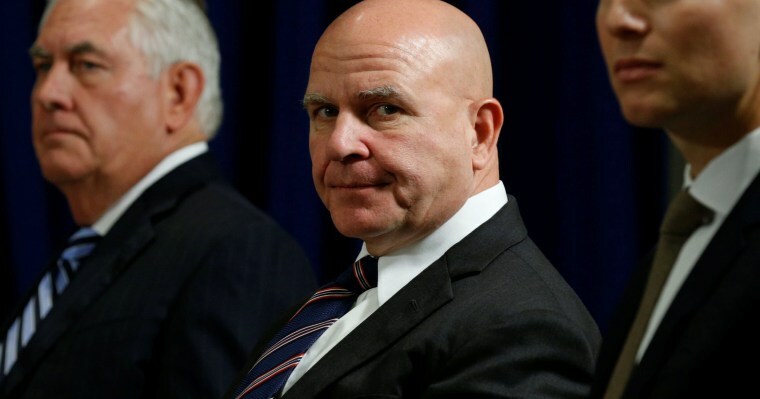 McMaster is still in the job and he’s doing a really fine job." Two people close to Biegun said he would need several weeks to get his financial affairs in order to be able to join the administration this spring. Biegun did not respond himself to a request for comment, but Ford Motor Company spokesperson Christin Baker said, "Steve has no plans to leave Ford." White House Principal Deputy Press Secretary Raj Shah said: “We frequently face rumor and innuendo about senior administration officials. There are no personnel announcements at this time." NSC spokesman Michael Anton responded by saying that he was just with the president and McMaster in the Oval Office. "President Trump said that the NBC News story is ‘fake news,’ and told McMaster that he is doing a great job," Anton said. McMaster joined the White House last year to replace Michael Flynn, who resigned after just 24 days in office amid revelations that he had lied to Vice President Mike Pence about his dealings with Russian officials. Flynn, who was a target of the FBI’s investigation into the Trump campaign and potential ties to Russia, has since pleaded guilty to perjury and is cooperating with the special counsel. McMaster had no ties to the Trump campaign and was serving as director of the Army Capabilities Integration Center in Virginia when he was named national security adviser on Feb. 20, 2017, choosing to remain an active duty Army lieutenant general rather than retire from military service. But his tenure has been rocky. There have been staff shake-ups, questions about McMaster’s decision to voice political positions while still in uniform, and public disagreements with Trump. Most recently, McMaster told a forum in Germany that Russian meddling in the election was "incontrovertible," a comment that drew a quick rebuke from the president. “General McMaster forgot to say that the results of the 2016 election were not impacted or changed by the Russians and that the only Collusion was between Russia and Crooked H, the DNC and the Dems,” Trump wrote on Twitter. McMaster is a widely respected military general with a storied career. As an Army major, he turned his Ph.D. dissertation into a best-selling book that became mandatory reading inside the halls of the Pentagon and on military bases around the world. “Dereliction of Duty” held military leaders responsible for the U.S. defeat in Vietnam, arguing that they quietly acquiesced to the demands of President Lyndon S. Johnson rather than providing their best counsel. McMaster took over command of U.S. Army Training and Doctrine Command in 2012 and was planning to retire last summer until he got a surprise call from the White House in February 2017. Now, a year later, a source close to Mattis said the Pentagon chief assured Kelly that he would offer McMaster a graceful landing, either another three-star job in the Army or even a promotion to a four-star general. Courtney Kube and Carol E. Lee contributed.